If your goal is to become a special education teacher, there is a certification needed to teach special education in various settings. As you research all of the different degree programs that you can take, you should always consider the paths to licensure that you need to take to become certified. It takes a special level of dedication and passion for teaching to become a special education teacher. You must be willing to work with a class of students who have highly individualized sets of needs and help them learn information and retain the information regardless of their circumstances. If you possess these qualities, read on and learn about the certification that you will need before you will be given your own special education class. You will need to check with your state’s Department of Education to discover the requirements to earn your teacher certification. The requirements from state to state can vary, but you will need to complete a formal degree program with an accredited school. Most schools require you to possess a four-year Bachelor’s degree in education before you can sit for skills assessments and competency tests. Once you meet the credit hour requirements, you can take a basic skills assessment test, a reading competence test and a subject matter competence test in the form of a specialized Praxis Exam. Once you pass all of the exams, you will hold a certification to teach a general class or a specific subject in a higher grade level. If you already possess your Bachelor’s in Education, you will need to spend time Special Education Credential program that will cover coursework you need to complete to earn your speciality. This will replace the need for an entirely different degree majoring in Special Education. If you are sure you want to be a Special Education teacher from the moment you enroll in school, taking a Special Education major or minor is the quickest path that you can take. 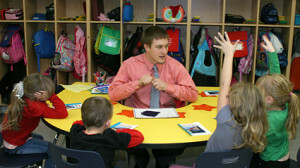 You may also consider a Master’s in Special Education as a replacement for a credential program. The next step is to join the National Association of Special Education Teachers where you can test for certification through the American Academy of Special Education Professionals. The Board Certification Special Education is a qualification within the field that shows that you are committed to the professional practice of special education. The standards set by the AASEP are beyond those that are set by state licensing boards. Keep in mind that you will still need your state licensing and any certifications that are required in your state if you aspire to earn your BCSE. Having the BCSE will place you in a elite group of professionals who meet the strict professional standards of the Academy. For teachers and prospective teachers who are serious about becoming a specialist, it is important to learn about the paths that will help you earn credentials that will help you build a reputation in the field. Only after you study for your formal degree and complete programs for the certification needed to teach special education can you apply for positions and then take on your own class of students with special needs.